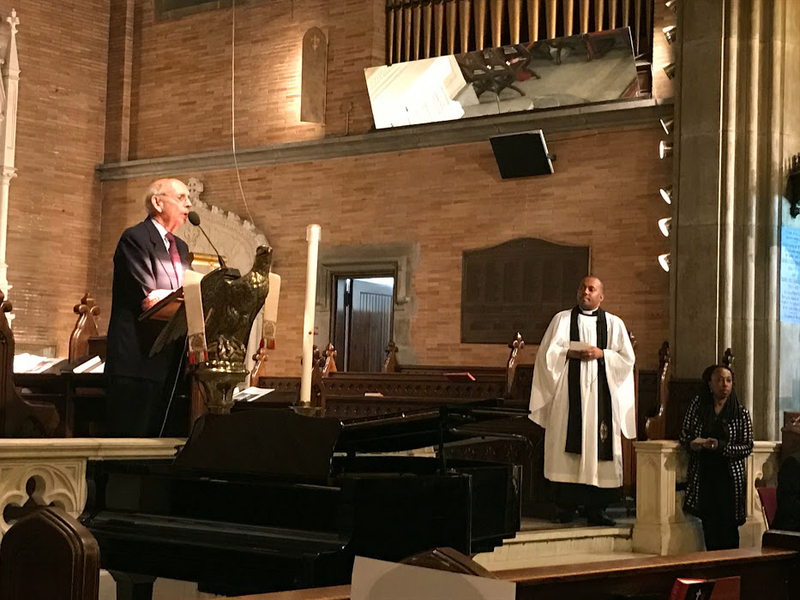 [Episcopal News Service] Supreme Court Justice Stephen Breyer made an appeal for the importance of courts and the rule of law at an event honoring the late Thurgood Marshall. Breyer spoke on May 13 at St. Philip’s Church in New York, addressing a crowd of several hundred on the occasion of the 10th annual Thurgood Marshall Law Day, which honors the former Supreme Court justice who once served on the Harlem church’s vestry. Marshall, the first African-American to serve on the Supreme Court, lived in New York while serving as an attorney for the NAACP, and joined the historically black St. Philip’s in 1938. The Episcopal feast day honoring his life and work, May 17, is the day he won his most famous Supreme Court argument, Brown v. Board of Education. The program began at 4 p.m. with an Evensong service with readings from Amos and 1 Corinthians. The Rev. Patrick Williams, St. Philip’s interim pastor, was the celebrant and the Bishop of New York Andrew M.L. Dietsche, offered a blessing to kick off the speaking program. Breyer paid heartfelt tribute to Marshall, who retired from the high court in 1991 and died at age 84 in 1993. Clutching a biography of Marshall stuffed with leaves of paper scrawled with handwritten notes, Breyer discussed the legacy of Brown v. Board of Education, the 1954 case in which the court found that state laws establishing separate schools for black and white students were unconstitutional. Marshall, arguing before the court in that case, “didn’t discover some part of the law that everybody didn’t know full well, it’s here it’s in this constitution,” said Breyer. “Either you believe in this document or you don’t you believe in that equality or you don’t,” he said. “Of course it helped America by producing integration, but it helped America in other ways too that are just as important,” Breyer said of the court’s ruling in Brown. “You want the rule of law in Ghana, you don’t have to convince the judges. The people you have to convince are the people who are not judges or lawyers,” Breyer said. Breyer said that the 1954 case Brown v. Board of Education was the “most important” Supreme Court ruling, but that Cooper v. Aaron, a follow-up case that also dealt with school integration, was his “favorite.” The court’s ruling in Cooper held that states had to follow the orders of the Supreme Court and desegregate schools, even if they disagreed. The consensus that the judiciary must be respected, even when its rulings are disagreeable or outright wrong, is vital to society, Breyer argued. As an example, he brought up Bush v. Gore, the 2000 ruling that halted a recount in the presidential election and effectively allowed George W. Bush to assume the presidency. “Before you reach that conclusion, turn on the television set and see what happens in the countries that try to settle things that way,” Breyer said. Following the talk, attendees gathered in the undercroft for a reception. Barksdale, a lifelong member of St. Philip’s, was a child when Marshall was on the church’s vestry. He reminisced with co-chair of the church’s Cultural Committee, Beverly Brown, about those days, when Marshall coordinated the annual St. Philip’s Day celebrations in the very room they now stood in. “We were running around in the undercroft with the other kids, while the adults were doing what we’re doing now,” said Brown, laughing. Senior Warden Charles Williams III said that it was important for the church to host speakers from outside the Episcopal community, such as Breyer, who is Jewish. St. Philip’s does have a connection with Breyer, as his daughter Rev. Chloe Breyer is an associate priest for the congregation. Williams pointed out that “it’s not often you get a Supreme Court Justice, especially in a church,” noting that even Marshall intentionally became less involved in church life after taking his place on the high court, to avoid any potential sense of bias. John W. Watkins, an attorney with the Brooklyn District Attorney’s office, helped plan the event, which drew a large student contingent from the John Jay College of Criminal Justice. – Keith Griffith is a New York-based freelance journalist. He is a member of St. Mary’s Episcopal Church in Harlem. I hope the same respect is shown for Clarence Thomas in the future. Justice Thurgood Marshall was a phenomenal lawyer and first. He struck down historic discrimination in the U.S., Clarence Thomas has not. In addition, Clarence Thomas is not a cradle Episcopalian and has rarely spoken while on the bench. Justice Thomas has chipped away at Thurgood Marshall’s legacy of equal protection under the law for all. As an officer of the court, Thomas deserves respect, but his courage, compassion, and accomplishments pale compared to Marshall’s.